"You guys have been amazing role models for local food. Keep up the good work." This was my first year participating in a CSA, and after much research, I decided to use Lake Breeze. I am thrilled with my choice. The produce is absolutely beautiful and delicious, and I appreciate the email sent to us on pick-up days letting us know what's coming, along with helpful recipes. The pick-up is very convenient, and they have been incredibly flexible during weeks when I have to switch my pick-up from Wednesdays to Saturdays at the Farmer's Market. I absolutely recommend this to anyone wanting to try out a CSA, and I also recommend getting an egg share, which supplies the best eggs we've ever had! I first started buying produce from Lake Breeze Organics at the Evanston Farmer's Market because they have beautiful, flavor-intensive organic products and are very enthusiastic about what they grow. 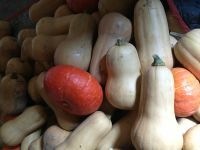 They offer things that I had never seen, like tromboncino squash, San Marzano tomatoes, cucuzzi (an edible gourd), an amazing variety of delicious greens, heirloom fruits and vegetables. I love learning new vegetables! In addition to shopping at their market stand, I signed up for their CSA: weekly summer deliveries of the highest quality organic produce at a really reasonable price—with organic fruit (rhubarb, blueberries, strawberries, apples) included. Chad and Danika are always eager to tell me what's new or especially good and how to use it. Lake Breeze Organics is “know your food, know your farmer” at it's best. Last year was our first year with Chad and Danika and we were so pleased! The fruits were amazing and I don't think the sour cherries made it home from the pick-up! The veggies were fresh and delicious--getting them every week was a great way for me to incorporate more greens into my family's diet. The recipes that went out with the weekly emails were helpful, especially when I got a product I hadn't purchased before (rainbow chard, delicious by the way!). Had a family member pick up my share when I was out of town and they were amazed! Also had neighbors drooling over the fresh garlic. Highly recommended! Last night we did a Mizuna & Eggplant stir fry in olive oil, two of the Japanese eggplants with a whole bunch of the mizuna, with garlic and onions (as suggested by Danika), savory (salt/pepper/basil), and it was fantastic. 100% Lake Breeze. Tonight, equally fantastic, I cubed the white sweet potato I bought from you guys on Saturday and oven-fried the cubes. Served it with the haricot verts and fresh baked salmon (seasoned with olive oil, garlic salt, and dill weed, with lemon slices on the top, our favorite seasoning for salmon). We're in heaven. You guys are the best! Lake Breeze is my favorite stand at Evanston Farmer's Market. I always look forward to sampling their produce - and I haven't tasted a single fruit, vegetable or green of theirs that I did not like. Their selection of heirloom tomatoes and other vegetables is remarkable. Just thinking about their amazing watermelons, apples, salad mixes, green and purple beans, makes my mouth water; their apple cider tastes sooo good too! And it's always fun to stop by their stand to chat. I am looking forward to the new season to do it all over again! We recognize the value of supporting libraries, theatre and music and we are also fortunate to have the opportunity to support small organic farmers who grow delicious, healthy fresh food-and deliver it to us every week! The weekly box of fresh produce from Lake Breeze Organics has completely changed the way my family shops and eats. We now wait to see what wonderful surprises arrive in our weekly box and plan our meals around them. We have learned about new varieties of fruits and vegetables and tried lots of new recipes and suggestions. Thanks to their efforts, the Evanston Farmer's markets now make fresh midwestern produce available all year long. I am so grateful to Chad and Danika at Lake Breeze Organics for bringing us fresh, healthy, delicious food and new ideas all year round. All so delicious and oh so yummy! I never really thought of myself as the CSA type. I love to eat and love to cook but I just thought it was too expensive and that I would get all cabbage and that it would be a hassle or something. Lake Breeze Organics, though, is something else: beautiful, fresh, delicious produce all summer long, delivered to a convenient location, with the addition of great recipes! Not only is it not all cabbage but there are blueberries, Asian pears, sour cherries! Heirloom tomatoes! For less than I would spend at Whole Foods, and with the satisfaction of supporting a small business run by really sweet people. I look forward to my CSA all winter long, and it really is the best part of summer. Thank you so much for your tireless efforts to make this year's share so diverse and successful! This was my first year doing a CSA and what a terrific inaugural experience you made it. Every week my good friend would come over and we'd put our heads together to put together a tasty meal using ingredients from that week's basket - often getting creative and trying out new recipes and creations we made up! We'd take photos of our creations and post them on facebook...soon enough on the nights we'd through down in the kitchen we'd have requests to join us for dinner or for the recipe. In short, you not only infused some fresh goodness into our diets- but inspired others to cook fresh! I'm looking forward to next year! Thank you!